Comics Therapy. New Reviews. Just Analysis. Two books from April 30, 2014. Plus your Nerd Confessions (about your creator dream teams). 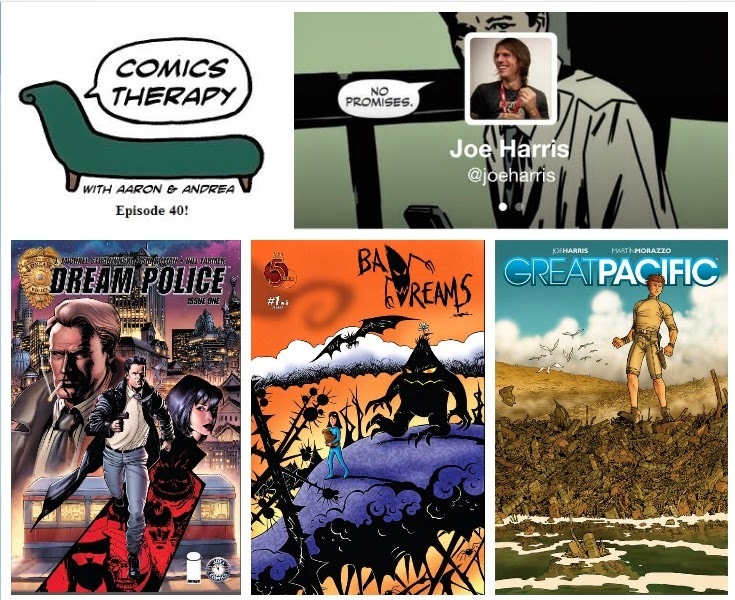 On The Couch: writer Joe Harris. The theme this week is sleep. Specifically the kind of sleep where dreaming is possible, if not inevitable. Everybody dreams. But through thousands of years of speculation and study, we’re no closer to really understanding why we do or what they mean. Dreams in fiction have a special power all their own, often exploring the more surreal aspects of this shared experience we have no control over. It all comes down to how much you trust your ability to stay safe within your own subconscious. An all-ages blend of Wizard of Oz, Labyrinth, and maybe even a bit of Harold and the Purple Crayon. Joe has written for all the major publishing companies, including Marvel, DC, Dark Horse and Dynamite. He published two creator-owned miniseries, Ghost Projekt and Spontaneous, and a graphic novel, Wars in Toyland, with Oni Press. He is, of course, currently writing his creator-owned series Great Pacific, published by Image Comics, which we talked about two weeks ago in episode 37 and X-Files Season 10, published by IDW, which we talked about way back in September in episode 9.